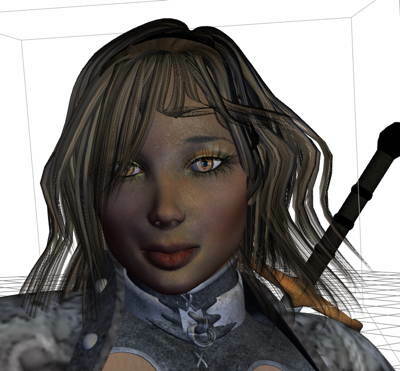 So, we start up DAZ 3D Studio and load the base model Victoria 4. Loading those models take a while, specially as DAZ 3D only load using one thread, but that is OK with me as the program in default setup is free. I’ve expanded mine a little with functions and mostly 3D figures and props, but still, hard to hit what MAYA and other apps cost, that easily hit the $3000 mark, and many 3D objects for those apps costs $100-$300 for a basic model, where a similar model for DAZ Studio will cost you maybe $20. This is a screenshot from loading Victoria 4. And here she is, say hello to Victoria 4. I decided to use one of my newest investments, the Ebony skin and this is how she looks in ebony, with some muscular mods. 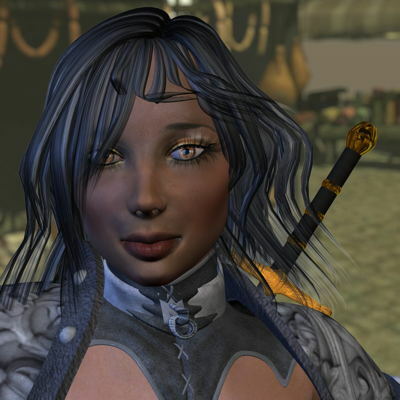 Many of the additions to Victoria depend on V4 Morphs++ and some of the other Morphs, which is a basic system to add and insert modifications to a model. If you are going to purchase something on Daz store, it is important to check the dependencies, as I did forget in the beginning. After adding some cloth props and figures (posable cloths are figures), we got this, very fantasy looking. I also added a hair. The clothes come from two different sets. 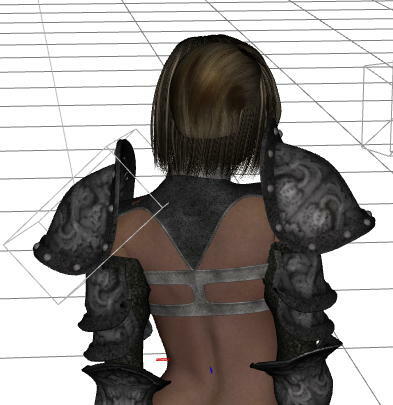 This is a from behind picture, as you see the armor looks a bit weird after I changed the basic pose. Time to focus on the important stuff, doing some facial tweaks and adjusting the shoulders on the armor, we got this pretty fighter. 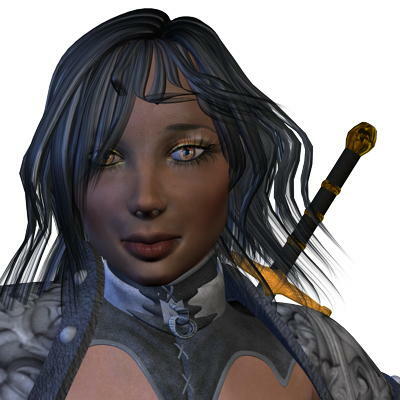 She still needs something more, the hair is to tidy and where is the sword? So, I picked the sword that came with the default materials, didn’t have time to create my own sword. Now it’s time to fix her hair and the face. You adjust face and hair (and everything else) with sliders and parameters, and the more stuff you have installed (and purchased) the more sliders you get. Here are just a few samples of the parameters you can set for the hair I use, every prop or figure has it’s own set of parameters. And here are some of the figure parameters. When you purchase morphs and morph injections, you activate more settings. HEre you can see Morphs ++, Elite and a few others. So, I changed the pose of the hair, both the material to a darker hair, and the posing. Now she looks like a wild fighter not an uptown girl. 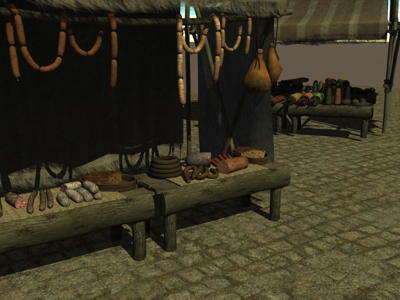 As I need a background for her, I quickly toss two items from Medieval market in Carrara 8 and add a realistic light render setting to it. I then blur the image using the program I always forget to talk about but I use constantly, even preparing the images for posting here, GraphicConverter. Now, we add our fighter NPC over this out of focus background, and she will get even more attention from our eyes. I assemble the final image in OmniGraffle. OK, what so you say? Is this a good way of providing NPC faces to the names. How would you as a DM describe this girl in a way that the players would get a good picture in their heads? So, A picture says more that 1kb (1024) words. Well, it all depends on the setting and mood of the adventure and game. I would present the players with the picture directly after a brief setting and area description, leting it sink, and then describe her more in person. Like how she’s standing, what she’s doing, whats she’s carrying and so fort. Trying to describe her physical traits and so comes in second hand since the picture is at hand. Like you said “A picture says more that 1kb (1024) words”. As to what I would say exactly is more tricky, as I said in the beginning, depending alot on the mood of the game. Good point there, and I agree. This is not for the brief NPCs you are just passing by in the market, but those who are driving the story with or against the PCs. 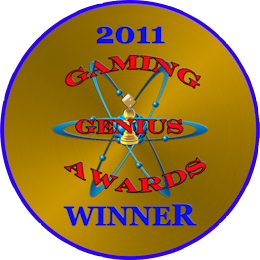 And it works better for some games and some settings. I think I show the picture, then roleplay the personality as good as I can, which I think can together with the picture give the right impressions. And, you can download DAZ Studio 3 for free.